Nicholasville City Hall is located at 517 North Main Street, Nicholasville, KY 40356; phone: 859-885-1121. Photo: Hoover House, ca. 1910, South Main Street, Nicholasville, KY. Listed on the National Register of Historic Places in 1984. Photographed by User:Nyttend (own work), 2010, [cc0-by-1.0 (creativecommons.org/publicdomain/zero/1.0/deed.en], via Wikimedia Commons, accessed August, 2013. Nicholasville was laid out in 1798 and named for George Nicholas, a Revolutionary War colonel known as the "Father of Kentucky's Constitution." It is the county seat of Jessamine County. 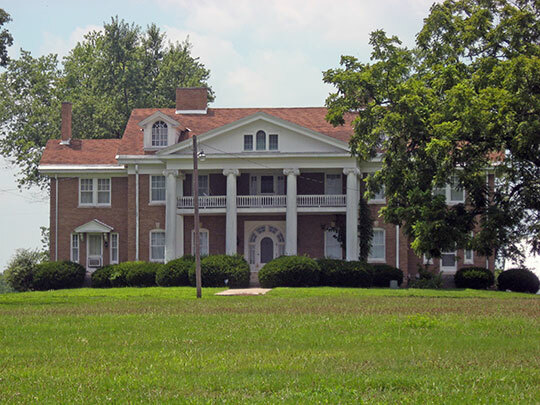 Nicholasville, the seat of Jessamine County, resembles a Kentucky town of earlier days. Many of its old houses border its quiet, tree-shaded streets. It was first settled in 1798 and named for Colonel George Nicholas, a native of Williamsburg, Virginia, and a member of the convention that met in Danville in 1792 to frame a State constitution. A Revolutionary War Colonel, Nicholas is known as the "Father of Kentucky's Constitution." "Elkhorn River, a branch of the Kentucky, from the southeast, waters a country fine beyond description. Indeed, the country east and south of this, including the headwaters of Licking River, Hickman's and Jessamine Creeks, and the remarkable bend in the Kentucky River, may be called an extensive garden ... The banks, or rather precipices, of the Kentucky and Dix Rivers are to be reckoned among the natural curiosities of this country. Here the astonished eye beholds 300 or 400 feet of solid perpendicular rocks— in some parts of the limestone kind and in others of fine white marble, curiously checkered with strata of astonishing regularity. These rivers have the appearance of deep, artificial canals. Their high rock banks are covered with red cedar groves.